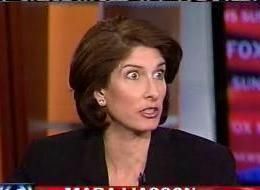 Should Fox News Fire Mara Liasson for Being Compromised by NPR? | Virginia Right! The Juan Williams firing by NPR was less about what Williams said as where he said it. Face it. The Liberals running NPR believe Fox News should go away. Liberal media hates Fox News and take every opportunity to tell their viewers Fox News is not Fair and Balanced, but, rather a right wing mouthpiece. And having liberal opinions expressed on the network simply does not fit into this lie. And Fox News is crawling with liberals aside from Juan Williams: Alan Colmbs, Bob Beckel, Kirstin Powers and more. But NPR, who takes nearly a half million taxpayer dollars per year to echo the liberal message, while pretending to be objective, still has their tentacles in at least one other Fox News regular contributor: Mara Liasson. With the firing of Williams, there is no doubt that Liasson is on notice from NPR: You could be next! So, how does that implied threat to her NPR job effect her Fox News analysis and opinion? Well, a person of integrity would be totally unaffected. But Liasson is far less charismatic than Williams, and it should be noted that Williams is at the low end of the charisma scale. In other words, Liasson is on Fox News, not for her charm and wit, as she is rather a dullard, and more for her opinion. But with her NPR job hanging in the balance on her every Fox News word, Liasson must toe the liberal line or walk the unemployment line. Her personality is such that an expanded role at Fox, such as Williams received upon being fired, is unlikely – unless Fox News simply wanted to be charitable. A few shows here and there is the best Fox News could – or should – do. So, that brings us back to the question at hand. Clearly, Liasson’s opinion is now tainted. She can no longer offer unabashed and truthful opinion and must spew NPR approved babble, or face the NPR firing squad. Already her appearances seem to be an even further leftward lurch as Liasson opined this week that using a Medical Savings Account to purchase over-the-counter medications such as aspirin was essentially a taxpayer subsidy. This, of course, assumes that all income and wealth belongs to the government and anything you are allowed to keep is a subsidy. The NPR halls no doubt erupted in cheers. Liasson got the message. Sit, girl. Good dog! This negates Liasson’s value as a contributor to Fox News. We will no longer hear honest opinions from Liasson, launched without fear of reprisal, and the Liasson 2.0 opinion is now the same opinion shared by Soros 1.0. Not that they were that different to begin with. Liasson is a liberal after all. But the occasional admission that something was over the top will now be gone – banished by the powerful Soros funded left. Liasson is damaged goods and Fox News should do the kind thing – fire Liasson before she says something sensible and honest and jeopardizes her day job at NPR. Fire Mara Liassom, I’m tired of deceptive people in the tank for Hilary !! !